As I begin to position myself as an information source, an expert of sorts, on pregnancy, birth, and parenting, I’ve had to spend time thinking about what type of information I want to relay. Through Papoose’s website, Facebook page, and in-store customer interactions, I’ll be sharing news and information that may be of interest to new and expectant parents, because I believe that informed parents are better parents. It’s important now, in the early stages, to decide what messages I want to send and to what degree I want to inject my own opinions. As a certified lactation counselor, there are clear guidelines: use peer-reviewed, published studies, not anecdotal evidence; understand that the mother-baby relationship comes first; respect and support the mother’s goals for breastfeeding regardless of how they may or may not align with my own; never judge. These guidelines are equally fitting outside of my lactation practice. I need to stay true to Papoose’s mission, to support new and expectant families through the full circle of maternity and parenting in a way that encourages the natural process, informed decision making, and informed purchasing, but I also need to be aware that there are many acceptable ways to parent that differ from mine; I don’t want to alienate prospective customers or friends just because they chose an epidural or weaned at 6 months, for example. There’s a fine line there, because I don’t want to ignore my principles, from which stems Papoose’s goal of encouraging the natural process, but I don’t want to invalidate others. And I also need to remember that my beliefs are not yet mainstream in our country. I believe that, except in rare circumstances, nearly all women can safely vaginally birth their babies with no medication and intervention. I view birth as a natural process and a process through which women can be empowered and develop a strong sense of self. I believe that the best neonatal, maternal, and breastfeeding outcomes are achieved through birth with as little intervention as possible. I believe that women should have access to accurate, unbiased and complete information which allows them to make educated decisions about their prenatal, labor, and delivery care. It is clear, though, that mainstream American culture does not support these beliefs. Most depictions of birth in the media are highly medicalized and dramatized — inductions, augmentation, and medication are more common than not. Women are depicted as screaming, swearing, and writhing in pain. Just watch the introduction to the newest birth show, One Born Every Minute, on Lifetime. The first episode of that show (which I sat through in horror) “discussed” (not unbiasedly) the decision to medicate or not and portrayed the “natural birther” as crazy and putting her baby in danger, while implying that her labor (which lasted less than 24 hours) was taking too long because she didn’t medicate. As the Feminist Breeder said, Lifetime TV shows us there’s one unnecessary intervention born every minute. This show is not an anomaly. TLC’s A Baby Story thrives on the drama of near-emergency deliveries and MTV’s 16 and Pregnant is creating a standard of epidural, early induction, c-section, and formula feeding for our next generation of mothers. The CDC’s October 2009 National Vital Statistics Report which looked at data from 2006 found that in the U.S.
(64 percent) and Hispanic mothers (47 percent). I’ve read reports that some hospitals have an 80-90% or more anesthesia rate. Nantucket Cottage Hospital’s rate is above the national average at 75%, as is Mass General’s at 78%. As an advocate for natural childbirth, I have to think about what these rates mean. Am I, and other women who birth without medication, an anomaly because labor really is excruciating [and we just have high pain tolerances] or is it something about our country’s current birth climate that makes women decide to get an epidural? A review of medication rates throughout the world tells a very different story from those in the US. Most births in developing coutries are unmedicated, though this could have a lot to do with access to pain relief. A survey of the current practice of obstetric anaesthesia and analgesia in Malaysia found the epidural rate was only 1.5% overall for the country. Epidural analgesia services were available in all private hospitals, but 17.6% of government hospitals surveyed did not offer this service at all. Britain, France, and many other European countries have similar epidural rates to those in the US, but there are several developed countries with rates much lower than ours. The Netherlands, where nearly 1/3 of the babies are born at home, has seen an increase in epidural rates. In 2008, the teaching hospital in Maastricht reported that 25 per cent of women opted to have an epidural; a year later this figure has risen to more than 30 percent, but that’s still far below the U.S. One Australian study also found a very low epidural rate — 16.7%. I think the culture here probably supports natural birth better than back home, regardless of where you choose to birth. (I birthed my fourth baby in a Japanese hospital – and someday I will tell you that story, too – it was quite similar to my birth center births). The vast majority of my Japanese friends have had unmedicated births (in hospitals), so much so that it’s utterly unremarkable. 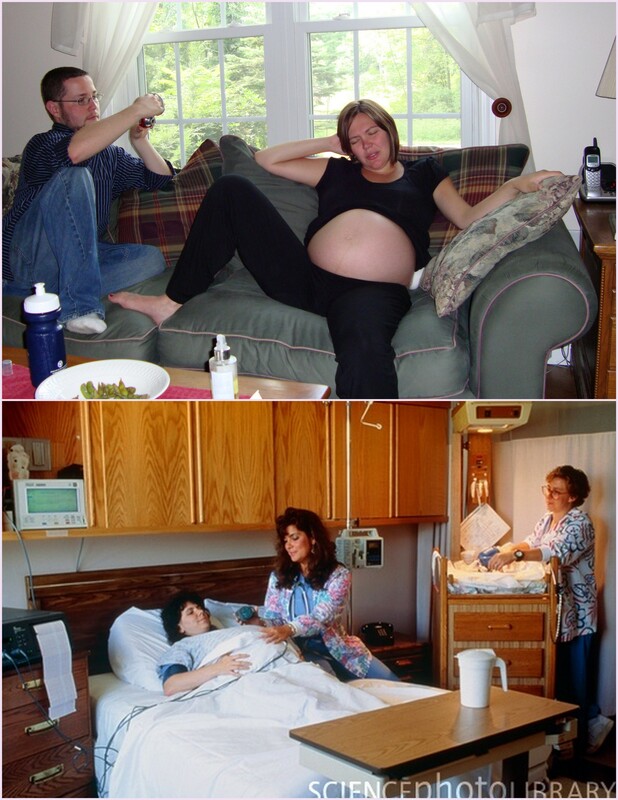 That I’ve had four babies naturally is taken for granted here; even the discomfort of labor is not spoken of that much. Among my friends here, birth isn’t not spoken of with particular pride either – it just is what it is. Women give birth – their bodies were made to give birth – that’s the message I hear, here. What, then, can be done to shift our cultural view of birth? A large part of this view comes from the beliefs of our birth care providers. It has been said that many physicians view birth as a medical procedure, rather than a normal bodily process, and believe that a normal pregnancy is a retrospective diagnosis. The Business of Being Born, a documentary, and Jennifer Block’s book, Pushed: The Painful Truth About Childbirth and Modern Maternity Care, provide a great picture of how this came to be, and how it can be changed — through education and advocacy; through a primarily midwife rather than OB model of care. As an individual, I know what my role is in this change. I love to tell others about the wonderful experience I had birthing Nora naturally. We are planning a home birth for our next baby (sometime way down the road) and I’m sure you’ll get to read all about it on this blog. I feel like it’s important to balance the almost constant negative birth stories pregnant woman hear with my positive one. I know that I want to teach Nora birth is natural and not scary; I’d love for her to witness natural birth long before she becomes pregnant herself (probably our next baby). Just as we know people are more likely to breastfeed if they have seen examples of breastfeeding while growing up and among their peers, I think women are more likely to view birth as a natural process in they hear about and see examples of it. As a business owner, I have to determine if there is a line between what I write here and what I write for Papoose. What role should the store play in a cultural change? I’d like to think that it will be a big one; I’m not really getting into this because I’m dying to do retail. With Nantucket’s small year-round population, it could be easy to make a big impact; our island could set an example for the rest of the state and country. I think the store could provide a platform for me to share not just my own, but others’ natural childbirth stories with a lot of people. But is this too much? Is it better to stick to research and studies, or would people also be interested in blogged birth stories and videos? What does this mean for someone with contrary views? For example, would someone who formula feeds feel bad if she saw news story after news story, study after study about the benefits of breastfeeding and harms of formula on our Facebook page? Would she decide to distance herself from the site or from the store altogether? Would it matter? Next article What is Wrong With Me??? I’ve been thinking about this and other posts you’ve written about feeling empowered by natural childbirth. I agree with the comment above that you’ll alienate some, but the mere fact that you live confidently will alienate some, you know? I think you should share what is beautiful and true and let the chips fall. All that written, I had an epidural with my first and natural with my second and can honestly say I feel equally awesome and awed about both experiences. I’m not sure what I’ll do (Lord willing) if I’m in the position to make a decision about childbirth in the future. The second was too fast for an epidural.